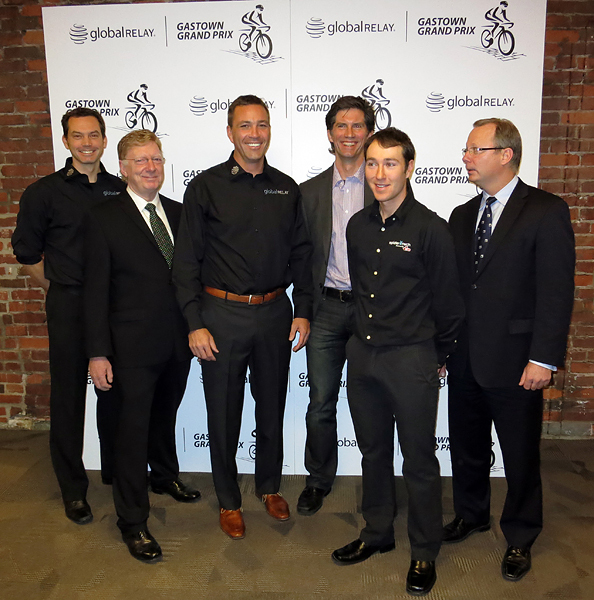 Global Relay, a Gastown-based technology firm, today announced a multi-year commitment to bring back the Gastown Grand Prix, (formerly the Tour de Gastown) as Title Sponsor. Wednesday, July 11th, 2012 will mark the revival of this prestigious professional cycling race, which has not been held since 2008. (Left to right): Mark Ernsting, Race Director, 2012 Global Relay Gastown Grand Prix; Vance Campbell, Gastown Business Improvement Society; Warren Roy, CEO, Global Relay; John Tolkamp, President, Canadian Cycling Association; Ryan Anderson, Team SpiderTech powered by C10; and Larry Goerzen, Regional VP Western Canada Enterprise Solutions, Allstream. The event, now named the Global Relay Gastown Grand Prix, is a Pro.1/2 Criterium cycling race where male and female riders complete 30 to 50 laps around a 1.2km circuit, reaching speeds of up to 70km/h. The Global Relay Gastown Grand Prix is proudly supported by Presenting Partner Allstream, Canada’s all-business communications provider, as well as the Gastown Business Improvement Society. The race will attract elite teams and independent riders at the Pro-Am level from across North America and around the world. Past winners include stars of the cycling world such as the last winners of the event Andrew Pinfold, Gina Grain (2008), as well as internationally renowned riders Lance Armstrong and Alison Sydor (1991). Race routing for the 2012 event will remain similar to that of previous years, with the course looping around Gastown and the start/finish line situated at the corner of Cambie and Water Streets. The Global Relay Gastown Grand Prix will be free for spectators and promises an exhilarating experience for cycling fans. Race Founder Roger Sumner gives the checkered flag to 1978 Gastown Grand Prix winner Brian Keast. The Global Relay Gastown Grand Prix is a part of BC Superweek - a series of several independent events that happen annually around the second week of July in the Lower Mainland of British Columbia, including the Tour de Delta, UBC Grand Prix, Giro di Burnaby and Tour de White Rock. 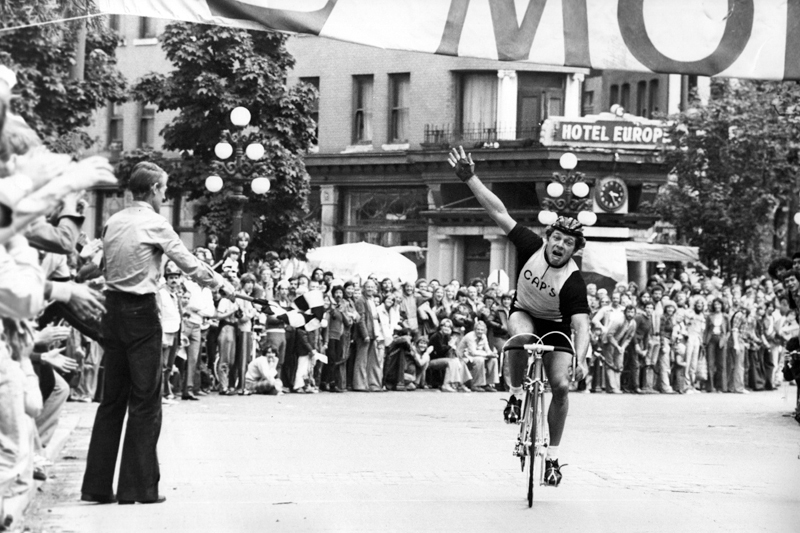 The Global Relay Gastown Grand Prix continues a rich tradition of professional cycling in Gastown. Since its inaugural year in 1973, the race has become one of Canada’s best-loved professional cycling events thanks to its challenging course, long history and historic location. With its headquarters at 220 Cambie Street, Global Relay has been a part of the Gastown community since its founding in 1999. By committing to sponsorship of this event from 2012 and beyond, the company aims to make a lasting contribution to Gastown residents and business, and to the cycling community. The Global Relay Gastown Grand Prix is presented with the generous support of the Gastown Business Improvement Area.